Moving home can be a lot of fun. I was really excited to live in my first home as a proper grown up! It can be stressful too, but it’s always worth it to get into your new place. I sometimes worry about living in a green, eco-friendly way, and moving home doesn’t necessarily fit with this. You can use up a lot of cardboard and other packing supplies, and hiring a large truck isn’t exactly great for the environment. But I have found some ways that I can easily make moving home greener, and I have them ready for when I next need to move. But until then, you can make use of the tips I’ve picked up. 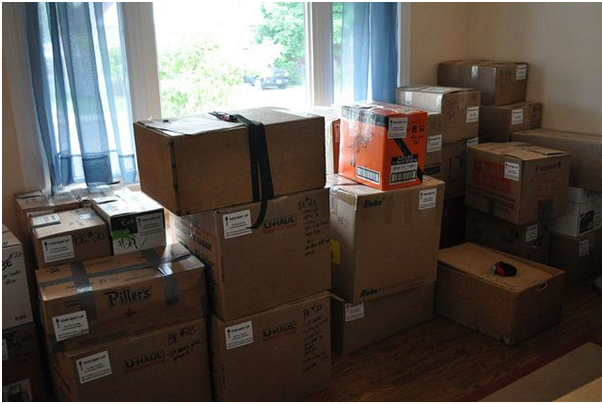 When you last moved, did you have boxes that you had never unpacked from the move before that? Everyone has junk in their house or apartment that they don’t need, but they carry it around from home to home. You might also have a wardrobe full of clothes you don’t wear, or pots and pans you never use. If you’re not going to resolve to use these things, it’s best to get rid of them. You can sell them, make a donation, recycle them or throw them away. Less stuff to move means you can hire a smaller truck and use fewer boxes, so there’s less weight for the van to carry. When it’s time to move, you have to get out the boxes, tape, bubble wrap and other materials. Using all of these isn’t very eco-friendly if you just throw them away when you’re done. It’s much better to reuse anything that you can. Naturally, you can’t use some things more than once, like tape. But when you get boxes, you could look for recycled cardboard boxes. Or you could use plastic containers that you can use for storage and keep for the next time you have to move. You can also get more than one use out of bubble wrap if you’re careful with it. It’s difficult to move on your own without help from anyone else. Sometimes you can just put everything you own in your car, but even then you need help finding somewhere to live. You can use companies who make it a priority to be green and ethical. For example, when you’re looking for somewhere to live you can find an ethical estate agent. Greenaway Residential gives some of their profits to local causes and charities. Some moving companies will make an effort to save fuel and be green in other ways too. Moving home requires lots of cleaning. You need to go through your old home before leaving, and you might have to clean at your new home too. Lots of harsh cleaning products might not be your thing, but there are alternatives. If you don’t want to do it yourself, you can use a green cleaning company. Otherwise, you can buy eco-friendly products or make home cleaning products. It’s not as hard to be eco-friendly when you move home as you might think. A few simple techniques can make your move greener. Previous Post: Real Togetherness: A Day Of Rustic Luxury at a Farm!